Tidbit of fact about me: I'm Canadian! Yup I'm the lonely Cunuck in the Sea of all things American. That's cool with me. So for this very awesome Canada Day I wanted to share something with you that is a twist on something truly Canadian. Pouteen. Yes it's one of the things best made in Canada. Most People don't know what it is & that's ok. But this... This is a MUST try! Bake french fries as directed on package. Meanwhile, mix sour cream, dressing and garlic until blended. 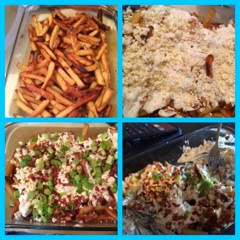 Place french fries on platter; top with sour cream mixture, cheese, bacon and onions. Serve immediately. We ate ours right out of the pan! !